Helper static method to return an xml escaped string. Implementation to format the data. This is called recursively. 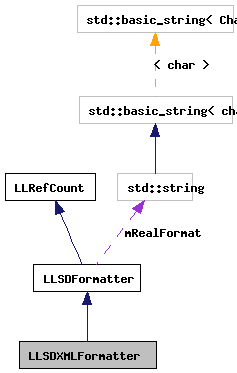 Formatter which outputs the LLSD as XML. Definition at line 392 of file llsdserialize.h. Definition at line 57 of file llsdserialize_xml.cpp. Definition at line 52 of file llsdserialize_xml.cpp. in A valid UTF-8 string. Definition at line 224 of file llsdserialize_xml.cpp. Referenced by format_impl(), and LLControlGroup::saveToFile(). Definition at line 62 of file llsdserialize_xml.cpp. References format_impl(), LLSDFormatter::OPTIONS_PRETTY, and S32. Definition at line 79 of file llsdserialize_xml.cpp. References LLSD::asBinary(), LLSD::asBoolean(), LLSD::asDate(), LLSD::asInteger(), LLSD::asReal(), LLSD::asString(), LLSD::asUUID(), LLSD::beginArray(), LLSD::beginMap(), end, LLSD::endArray(), LLSD::endMap(), escapeString(), LLSDFormatter::formatReal(), i, LLSDFormatter::mBoolAlpha, LLSDFormatter::mRealFormat, LLSDFormatter::OPTIONS_PRETTY, S32, LLSD::size(), LLSD::type(), LLSD::TypeArray, LLSD::TypeBinary, LLSD::TypeBoolean, LLSD::TypeDate, LLSD::TypeInteger, LLSD::TypeMap, LLSD::TypeReal, LLSD::TypeString, LLSD::TypeUndefined, LLSD::TypeURI, and LLSD::TypeUUID.